A nuclear-powered submarine which ran aground off the Isle of Skye in October has had to return to port because of a defect, the Ministry of Defence says. HMS Astute returned to its base in Faslane after breaking down last week on what was its first day back at sea, the Mail on Sunday reported. The newspaper said a fault in the steam plant had been identified by experts. "HMS Astute has been completing sea trials and has returned to have a minor defect corrected," the MoD said. The newspaper reported that the fault had affected the propulsion and desalination system that makes sea water drinkable. HMS Astute ran aground on 22 October and was towed free after becoming stuck on a shingle bank for about 10 hours. However, it was damaged during the rescue operation in a collision with a coastguard tug, the Anglian Prince, which had been sent to free it. 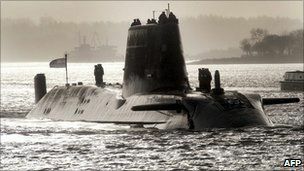 The £1bn submarine returned to its base at Faslane on the Clyde three days after the grounding. Last month the naval officer in charge, Commander Andy Coles, 47, was relieved of his command. He was replaced by Commander Iain Breckenridge. The submarine was built by defence giant BAE Systems at Barrow-in-Furness, Cumbria. It is the first in a fleet of seven which will replace the Trafalgar-class submarine. The vessel can carry a mix of up to 38 Spearfish heavyweight torpedoes and Tomahawk Land Attack cruise missiles. Il n'y a pas que le PA Charles de Gaulle qui a parfois des ennuis, nos amis britanniques constatent de nombreux problèmes sur le dernier né de leur sous-marin nucléaire, après un jour de mer il a du regagner la base de Faslane. Une panne qui toucherait à la fois le partie propulsion et la partie désalinisation de l'eau de mer. Le 22 octobre dernier le HMS Astute s'était échoué et avait été endommagé suite à une collision avec le remorqueur qui le dégageait. le Pacha avait été relevé de son commandement.